The Houston Philatelic Society Welcomes You! If you have an interest in Stamp Collecting, Postal History, or Topicals on stamps, or just want to find out more about this exciting hobby, we invite you to attend our next meeting. Visitors are always welcome, whether beginner or expert. The meetings are educational, interesting and provide the opportunity to add to your collection through auctions or trading with other members. Meetings are held on the first and third Mondays of each month at the West University United Methodist Church 3611 University Blvd., Houston, TX 77005 at 7:30 P.M.
Auctions are held about once every three months. This is an excellent way to add to your collection or sell unwanted stamps. 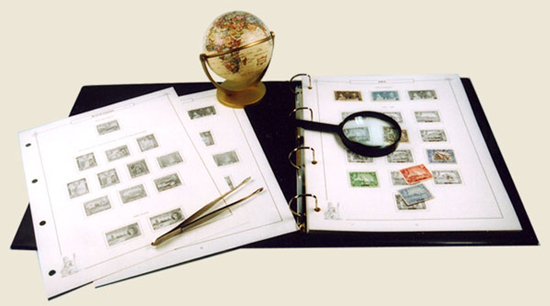 Slide shows are borrowed from the American Philatelic Society on a variety of interesting subjects. A great opportunity to buy or trade from other members. Every meeting, stamp catalogs are available for members to check out for 2 weeks to help them identify stamps in their collection. The Houston Philatelic Society sponsors The Greater Houston Stamp Show every year in September. Join us for the next meeting of The Houston Philatelic Society.